Today it seems there is a surveillance video camera nearly everywhere — in ATM machines, gas stations, elevators, parking garages, busy intersections and even some vehicles. Plus, it is common for many of these types of locations to have multiple video cameras offering surveillance from a variety of angles. It is safe to assume that “Big Brother” is watching us 24/7. It is no surprise that surveillance equipment manufacturers are now targeting the average homeowner. With the increased popularity of surveillance equipment, the costs for such systems are slowly coming down, but they can still be pricey. However, there are a few options for budget-minded consumers. A quick Internet search or even a trip to a home improvement store will most likely yield several choices for surveillance equipment. Try looking for surveillance equipment in other, nontypical outlets such as hunting/wildlife monitoring equipment, baby monitoring, ag/farm suppliers for horse and livestock equipment and even your local resale shops such as Goodwill. A good source for video equipment is wildlife or livestock surveillance cameras. These types of video surveillance cameras are very similar, if not the same, as the equipment sold in the home surveillance section at major retailers. Often, these models offer a subtle, less flashy exterior finish in less-than-glitzy packaging, which translates into a lower cost. For example, Arystone Productivity offers an easy-to-set-up AyrScout In/Outdoor Camera featuring night vision and a quality 640 x 480 picture priced at around $225. Although this video equipment is typically used to monitor livestock, it also can be used for other surveillance applications, including home monitoring. Another budget-friendly option is the Bushnell 8.0 cordless camera with video and audio capability. 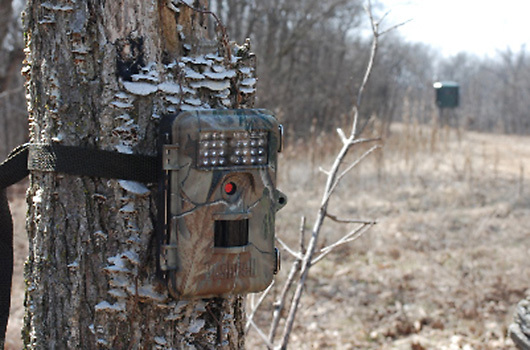 Big-box stores such as Cabela’s or Bass Pro carry this camera, which is typically used by hunters to keep an eye on game movement but also makes a great surveillance apparatus for your personal property. Easy to use with a battery life of one year, this unit is a good option for around $200. Another inexpensive alternative is simply to make it yourself. All you need is a camcorder, video feed wire and some type of monitor. This is where rummaging through a resale shop such as Goodwill comes in handy. With a little know-how, it is relatively easy and cheap to rig up. For example, older styles of camcorders are great, as long as they are in working condition. These are often found dirt cheap at garage sales or resale shops. Some sizes are more challenging to mount; however, they still make great, affordable options and intruders can’t help but notice them, which can be a good deterrent. Mount the camcorder in the desired location, then attach a video feed wire connected to a TV or computer monitor and you have an inexpensive surveillance system. Many folks are discovering that their home computers or even hand-held devices make great surveillance equipment. By simply purchasing a webcam and some monitoring software, you are on your way. Webcam prices range from as low as $10 and up, depending on the quality. Monitoring software varies based on your computer’s requirements. Thanks to a shaky economy, more people are looking for ways to live on a shoestring, and with a few of these ideas it is possible to monitor your personal space inexpensively. With a little ingenuity, you can create your own version of an eye in the sky. What are we doing to bring to the American voters what Governor Christie is really all about. The article in our FOP Journal entitled”Christie broke promises to Police, Firefighters and N.J. Voters” should be sent to all media outlets. I have not seen anything from the FOP anywhere that states that we are against Christie!